CHOOSE "CONTACT OWNER" IF INTERESTED IN RENTING. 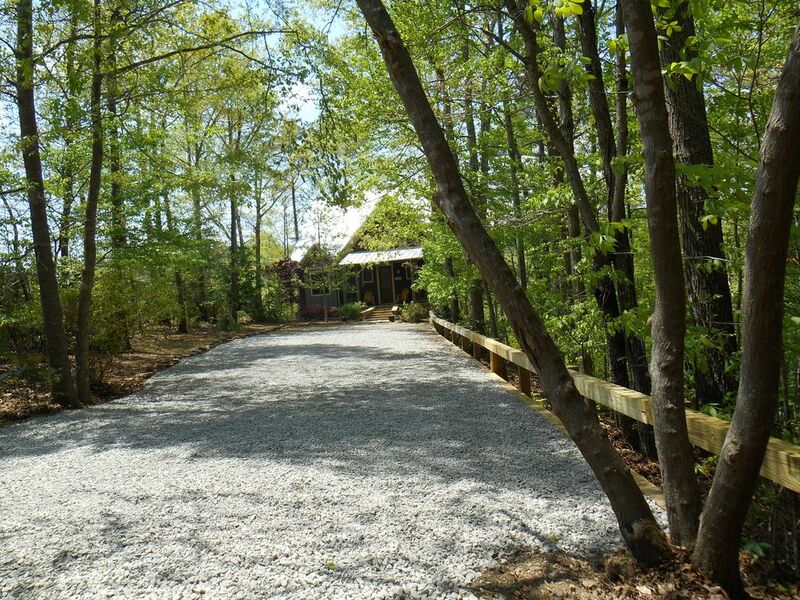 This three-level home sits on a secluded, wooded lake front lot with approx 150 feet of water frontage. It was designed for multiple families with kids. The view is absolutely spectacular with views of the beautiful clear water from all bedrooms, great room and game room. It has roughly 3100 square feet and has an additional 1700 square ft of decks and screen porches. There are two great rooms, one for the adults on the main level and a second for the kids (loft area). The main level great room has a tongue and grooved couffered ceiling with a wood-burn stone fireplace. Beautiful! The kitchen has stainless steel appliances and granite counter tops, and the kitchen also has breakfast area along with 2 additional bar stools for additional seating. For outdoor cooking, there is a large charcoal Weber grill on the main level deck overlooking the beautiful lake. On the main level there is a master bedroom (queen), with two bedrooms on the upper level (queen in each, with pack n play crib and toddler bed in one of the upper bedrooms) that share a large bath with shower. Also, on the upper level is the loft area equipped with a sofa bed and TV/Stereo system. On the terrace level, there is a fourth bedroom (queen and two rollaways with thick foam mattress) with its own shower. All baths are tile and all baths are large showers only. No tubs. On the main level, is a laundry room equipped with washer and dryer for your use. The game room (NEW TV HAS BEEN ADDED TO THE GAME ROOM) is on the terrace level equipped with foosball, pool table and one of the outside decks is right off the game room for easy access outside, where there is outdoor seating areas, table/4 chairs, 1 chaise lounge. There is a small kitchen area, also, on the terrace level equipped with all appliances for easy access to decks and lake area. ALL RAILINGS ARE CHILD-SAFE. The boat dock is a two slip dock with large swim platform and a covered area with table/4 chairs, plus 4 chaise lounges. There is a jet-ski platform for two jet-skis and 2 open boat slips for your use. In the on-season we have 60'+ of deep water off the end of our dock; in off-season we have 40'+ deep water off the end of the dock. What attracted us to Smith Lake is that it is rated as the third cleanest lake in the country. There are 500 miles of shoreline and a depth of 265 feet at the dam with over 21,200 acres of water. Much of the lake is in the Bankhead National Forest with miles of undisturbed wooded shores and spectacular views of large rock shorelines, cliffs, waterfalls, rock overhangs, and other scenic features. Makes for some wonderful pontoon boat rides! No matter what type of leisure, water sports, sightseeing or fishing you prefer, the cleanliness and beauty of the lake make them all more enjoyable. But above all, probably to us, just the peacefulness the lake itself has to offer. 5) 15 min from a local Walmart- if you have to go !! 6) 10 min from a large antique mall. One of the reasons we chose Smith Lake was because it was rated the third cleanest in the US and it also has deep waters. We live in GA and we have found that the people in AL could not be more friendly and helpful in every direction we have gone. One unique feature about our place is you can enjoy all the sun you want, OR you can enjoy a nice lounge in the shade. It is very peaceful at our house - no neighborhood noise; when my husband and I are there with or without our g'kids, we usually get out and do a morning walk when the weather is good before having bkfast. Wood is there for your use for the indoor fireplace and outdoor fire pit. enough parking for 5-6 cars. (2) Includes blender, mixer, coffeemaker, & KUERIG, toaster, crockpot, waffle maker, electric skillet. TV on all 3 levels. DVD player in loft area. There are a few books there. You may want to bring your own. Pool table, foosball, several box, board games (scrabble, pictionary, etc.) outdoor under covered deck is ping pong table, corn hole game. Double slip boat dock for you to park your boat. Sea doo ramp for you to use. NO BOATS SUPPLIED. You would need to bring your own life jackets, and/or water play toys. Cullman golf course 15-20 min from house. Antiquing within 12 min from house. 2 huge 'barns' of antiques. Cullman Golf Course - 15-20 min from house. Very pretty house and location. Amenities were very good for family gathering. A good time was had by all. Top Notch place. Very well kept. My group had the best time. The house was immaculate. This is the house we all want to retire at. Plenty to do at the house and amazing views while doing it. Beds were super comfy which is rare in a rental. Already planning another stay here if they'll have us. Thank you, SB, for submitting a review of our “Treetops”. It says a lot for someone as yourself to take the time out of a busy schedule to submit a review. It definitely helps other potential inquiries on their decision making. We do hope to see you again and welcome your stay. A gorgeous home in a gorgeous setting. Tree Tops has everything we hoped it would. What’s not to love? Decks upon decks, pool table, ping pong, fishing, games, TVs, beautiful lakefront views, well stocked kitchens (2)... We would do it again in a heartbeat. Tree Tops is fabulous. Thank you so much for your awesome and personal review of our Treetops. Wonderful comments! Love the one (of course) about my family pictures I have in the house, some of which I have just gotten them up this past summer. So glad you all enjoyed; do hope you are able to return. We would love to have you!! Beautiful home! Great place for a family gathering! Beautiful home very well equipped! This house has a perfect floor plan for two families with kids. The owners have done a great job of thinking of everything you could need. We have stayed at several homes on Smith Lake. Treetops is by far our favorite!! Thank you SH for a wonderful review of our Treetops. We built our home with multi families in mind. We have three children and their children. We wanted everyone to have their space. It works great for us. So glad you all have enjoyed with your family also. Hope to see you again at Treetops. Our family had so much fun at Treetops. I would definitely recommend this property to others! Thanks so much for taking the time to write a review on our home. So glad to have you all to stay with us on Smith Lake. We have a boat launch 3 minutes from the house where you can launch your boat, sea-doos, etc. that is used only by the residents in our area, have an outdoor fire-pit for roasting marshmallows on a cool night, lower deck to sit and view the beautiful view of the lake, 15 min from golf course, 20 min from the Aquatic Center (more info on this at the house) if you have a rainy day at the lake, 20 min from a great casual restaurant (the angler) for a night out to eat. Pontoon/SeaDoo rentals available from outside source - will deliver the boat to you. PLEASE NOTE: If you pay by echeck, there is no additional fees, other than the vrbo fees. If you pay by credit card, there is an ADDITIONAL processing fee of 2.5%, which the credit card carrier charges me, not vrbo. Thanks for paying by echeck, if possible. Boat Launch within 5 min of house. Have a contact for boat rentals.